A quieter, cleaner serge zone. 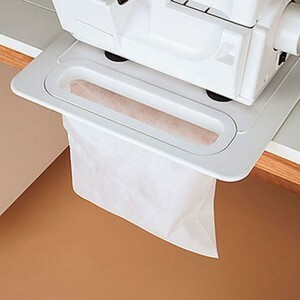 Complete foam backing provides a soft but stable surface that absorbs machine vibrations and sound. Catch-all bag keeps waste in one place, and it slides out for easy emptying. Large pad area fits all sizes of major brand sergers. 2" x 6-3/4" bag opening; 11-1/2" x 12" overall.